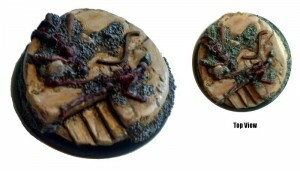 Armorcast released their new Murdered Martian Colonist objective marker over in their webshop. Also good for farmboy motivation to leave with an old guy on a space ship crewed by a guy who misuses the term "parsec" and a walking shag rug. The troopers stormed the sleepy Martian farm colony in search of information. When they didn't find what they wanted they made the settlers pay with their life. Two murdered Martian colonist burnt remains set on a 50mm round base. This piece makes an excellent sci-fi objective marker as well as a mini vignette. Cast in resin and supplied unpainted. Skeletons by Ebob used under license and designed by Ginfritter.